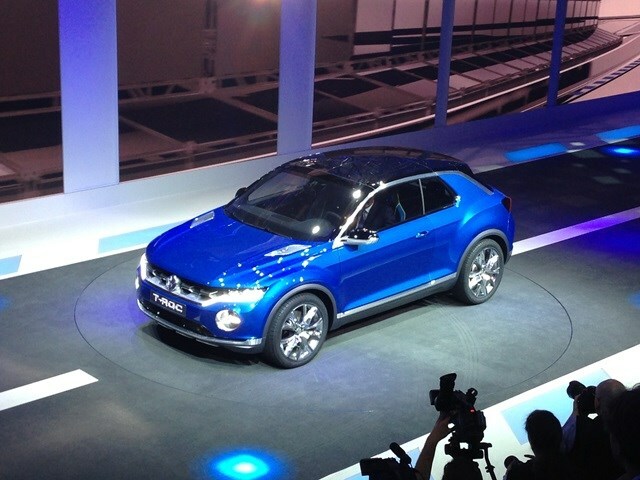 Volkswagen wowed the Geneva Motor Show crowds with its new compact off-roader called the T-Roc. While it is officially a concept car the T-Roc is looking like it is in near production form. The German company is already reporting performance figures for the car. The T-Roc is a two-door, four-seater off-roader with a targa style roof – that’s two mid-section roof panels that can be removed and stored in the boot. The T-Roc is smaller than its sibling four-door Tiguan which is similar in size to VW’s Golf hatchback. It uses the same 2.0-litre diesel engine as found in the VW Golf GTD hatchback and is tuned for pulling power. Volkswagen says the T-Roc can race to 62mph from rest in just under seven seconds, which is very quick. Running costs though look equally impressive with a claimed average of 57.6mpg (so reckon on mid-40s for real world driving) and CO2 emissions of 129g/km – that’s an annual car tax charge of £105 with first year free at 2013/14 rates. The car also uses four-wheel drive and VW’s well-proved seven speed automatic ‘DSG’ gearbox set-up particularly for the T-Roc. On the tech front the car features integrated cameras that project images when driving off-road onto a tablet mounted in the central console so a driver can spot oncoming obstructions and pot-holes. There is also safety kit including hill descent and start control and three driving modes (Street, Offroad and Snow) to aid the driver. As yet the VW T-Roc has not been confirmed it will go into production but it is thought likely it will be built and sold in the UK. VW has revealed its updated two-door sports car, the Sicrocco, and its small car, the Polo. The Sicrocco has a mild design tweak to break it up to date with new head- and tail lights, plus a revised bumper design. Also new alloy wheel designs are featured including for the first time, the option to fit alloys as seen on the high performance R version. Inside the dash and dials have been updated, while there is a new auxillary instrument cluster above the centre console that features a stop watch function, as well as oil temperature and turbo pressure. Engines are overhauled to provide more power while being more efficient. Entry-level car features the 1.4-litre petrol engine with 123bhp (up 3bhp), while a new 2.0-litre petrol engine replaces the higher powered 1.4-litre engine and is more powerful and efficient. There is a 2.0-litre diesel engine with two power outputs on offer with the lower powered one boasting an official average fuel figure of nearly 69mpg so reckon on mid-50s for everyday driving. The Polo has also received a very mild makeover to make it look more modern but it is under the bodywork that the greatest changes have occurred. Again it is revised engines to boost power while increasing the number of miles wrung out of a gallon of fuel and reducing car tax costs. Revised engines include a new 1.0-litre petrol engine that emits just 94g/km of CO2 so that’s free of car tax charges at current rates. The Scirocco order books open in May 2014 while you can get your order in for the revised Polo in July. Read the full Scirocco review here and the full Polo review here. 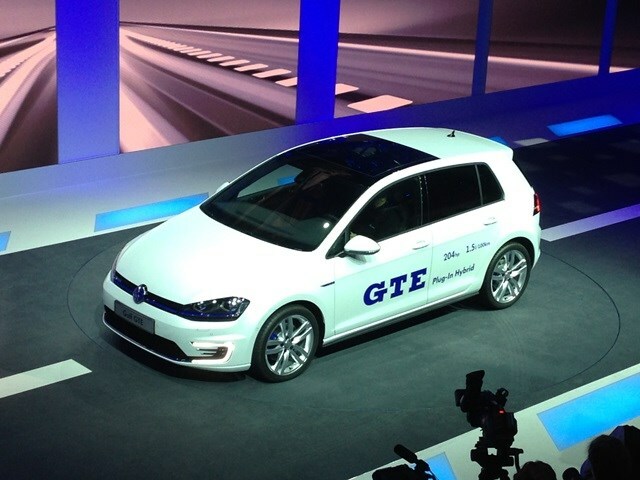 We also saw the new Golf GTE, a plug-in hybrid with GTI rivalling performance. Using a 1.4-litre TSI engine with 148bhp and a 100bhp electric motor the pairing combines to make a total of 201bhp. That allows the GTE to accelerate from 0-62mph in 7.6 seconds and onto a top speed of 138mph, all while achieving up to 188mpg and emitting only 35g/km of CO2. It has a theoretical range of 580-miles and can travel on electric power alone at speeds of up to 81mph. You can read about the Golf GTE in our full Volkswagen Golf review here.